My mum and I enjoyed a wonderful week in June spent between Italy and Switzerland. We were lucky that the weather was gorgeous and we had a thoroughly lovely week. We had to drive to Luton Airport as our preferred means of transport, the train, was experiencing weekend works and a comfortable departure time wasn't easy. I have driven to Luton before years ago and it was a bit of a fiasco although I didn't actually get lost finding the place and went the back way. This time, we went via the motorway and, well, didn't go wrong but didn't much enjoy it. There were delays and the final part of the journey, finding the Airparks site at Slip End, was the most troublesome, as I had anticipated. The Sat Nav worked but the cable didn't so we had to work it out for ourselves probably hence the reason that we weren't as early as we might have been. I realise that, in my last article about Lithuania, Luton Airport hadn't filled me with enthusiasm. It may have been that, at 6 a.m., I found it a bit of an assault on the senses but, this time, just after midday, it was much easier and better. Our easyJet flight was fine even if I was cramped for room again. I know I can pay extra to have more but I still find it a cheek, frankly. The greater issue was that Mum and I had booked an apartment in Venice and, well, we have had greater moments. For a start, we missed an email saying that an approval could not be obtained on the credit card and the booking was cancelled. 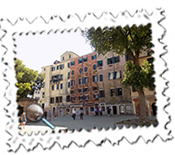 It happened with another hotel but, for whatever reason, payment was easily accepted on check-out with the same card... We had to re-book at greater cost and were due to stay in the Cannaregio region on the edge of the lagoon but had had trouble getting in touch with the owner. Emails went unanswered and, when I did finally manage to talk to the chap who we suspect was an agent, he merely said to contact him on arrival. I did it before our flight left mainly because I and my mobile phone are not the swiftest in sending messages. No reply there either so we went directly to the apartment. No-one there either. After a bit of a wild goose chase trying to find each other, I had to insist that the chap met us out outside a hotel which he did. There was some good in it, though. We had been moved: no reason was given when we finally met and asked why. We had been asked to meet at a Caffe Dodo which convinced us it was a hoax. We thought that he took us for a couple of duffers as old as the Dodo so it was with some surprise that we did meet. The place we were taken to was more convenient and was very nice. Okay, the fridge, air-conditioning and plugs didn't always work and I was mortified to fuse the place at night when plugging in the kettle but hey ho. It was comfortable and I - oh dear, say nothing - found out that my sofa bed really did turn into a full-size bed and was very comfortable at that. The apartment was bright and it was very nice. We ate well in different places during our three-night stay. 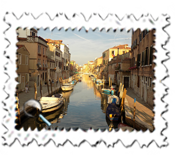 The first night was along the same canal where the apartment is and the second night we returned to a restaurant close to Santa Lucia Railway Station which overlooks the Grand Canal. My parents had eaten here on previous visits and the view is stunning. The last night we ate in the Venetian Ghetto, the area where Jews lived, and certainly enjoyed the tastiest and best food of all there. This quarter was in fact just a few minutes walk from the apartment. With such good weather, our first full day was spent visiting the churches of San Geremia (which houses the grave of Santa Lucia di Siracusa) and Santa Maria della Salute (built as an offering after the plague in 1630). 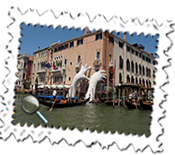 Both are well-known landmarks in Venice and both were most interesting. We had bought a transport ticket for use predominantly on the water boats, vaporetti, and, whilst not especially cheap at 30 euros for forty-eight hours, we did certainly make good use of it. 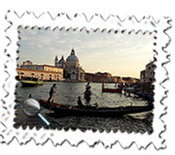 The No 1 vaporetto service stops at all points along the Grand Canal whilst the quicker No. 2 schedule only stops at selected points. 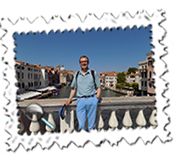 It was a busy but enjoyable way of seeing Venice and the many remarkable buildings especially along the Grand Canal. We enjoyed an evening ride down to San Marco, possibly the main touristic highlight of Venice where St. Mark's Cathedral, bell tower and Doge's Palace dominate. The Ponte dei Sospiri, or Bridge of Sighs, is close by. Venice had been lovely and, after three nights there, we moved on to Milan for a day. This was essentially to break the train and bus journey to Ascona which would have taken us through Milan anyway. Our two half days allowed us just enough time to visit the impressive Duomo and da Vinci's famous Last Supper painting. 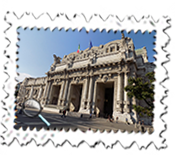 We stayed very close to Milano Centrale Railway Station which is surely one of Europe's grandest stations. We had booked into the Hotel Garda which was close by and could actually be seen soon after coming out of the station. It was a very friendly and fun place and the rooms were of a decent size and it was the ideal place to stay and good value. 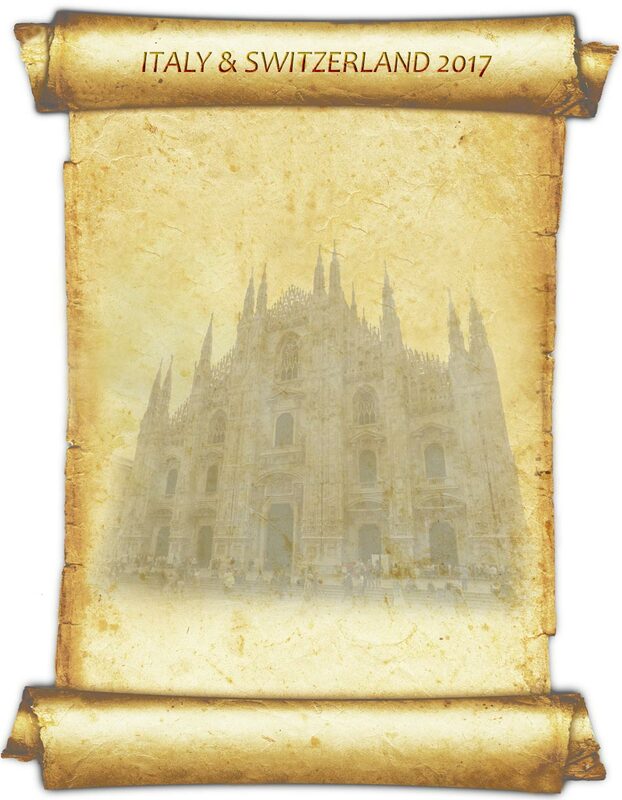 We had been fortunate to be able to buy tickets for da Vinci's painting which go on sale, I believe, three months in advance. I had made a note to get in on the first day and then had realised only that evening that I should have been earlier and everything had gone. Tour groups take them but a call the next day saw us actually quite comfortably pick two up at the normal fee of 12 euros each. 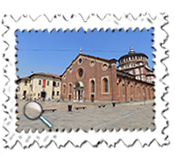 We did arrive too early but enjoyed a visit into the almost adjoining Santa Maria delle Grazie Church before going into its refectory where Leonardo's great work is housed. I have been before but was astonished that, when our group entered, everyone's camera came out. Last time, we were under the strictest instructions not to even attempt to take photographs but times have changed. It is indeed a remarkable work of art and we were delighted to have been able to buy tickets to see it. The depth of the painting makes it feel even larger than it already is. 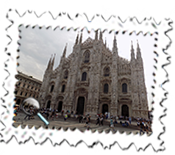 We enjoyed a decent meal next door to the hotel and were up early next morning to visit the equally remarkable Duomo as the second part of our trip. It meant going by metro which wasn't especially easy as my ticket was continually rejected! It was perfectly valid and I had enjoyed spitting out a few words of still embryonic Italian which at least had been appreciated by the seller. We would have had longer visiting the Duomo but for the lengthy ticket process which meant taking a ticket in an office outside and then having quite a wait. As our train to Switzerland left just before 11:30 a.m., we could only have fifteen minutes but it was enjoyable and worthwhile. There was a bit of chaos with the train as half of it wasn't used so we had to have our seats re-allocated but the journey was pleasant and passed through Como and Lugano before reaching Bellinzona where we changed. 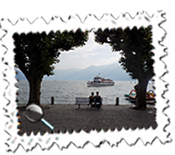 An onward trip by further train and bus via Locarno saw us in the delightful lakeside town of Ascona around 2:30 p.m..
Ascona is surely one of Switzerland's finest spots and we stayed in the Piazza Ascona hotel with terrific lake view rooms. 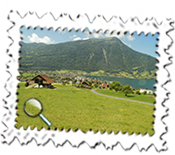 It is a friendly, if modest, hotel and the views come at a price but, with the Swiss Franc currently being very low, such rooms cost even more than they might have due to the poor exchange rate. The rooms were simple but the views quite unbeatable. That said, we were soon caught in terrific rains and were soon back in our rooms, the balconies being completely drenched. Fortunately, this was the worst of the weather and we had a wonderful three night stay there. 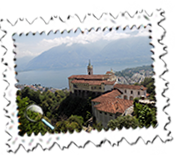 On our first full day, I suggested - and actually with no great conviction - that we should visit the nearby Locarno. 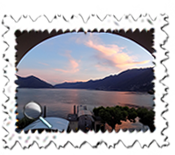 For whatever reasons, I suspected that our other full day travelling around Lake Maggiore on the steamers would be better but we found Locarno beautiful. The weather helped but the main piazza was lovely and we even returned in the evening to eat. 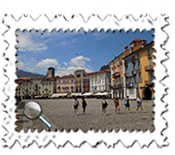 We were lucky that a type of tourist card, the Ticino Ticket, was offered free of charge and this included free use of buses and trains in the Ticino region with many other discounts. Mother was for it, son was for it but highly dubious as it seemed too good to be true. Whatever, we were given one, weren't asked to pay and used it handsomely. It seems to be an idea which has just become available this year. Whilst in Locarno, we visited the remarkable and picturesque Madonna del Sasso Sanctuary in the suburb of Orselina and which has terrific views over Lake Maggiore. We used the bus up and the funicular down and again thoroughly enjoyed the views. The day on the Swiss part of Lake Maggiore was again delightful, the weather improving as the day went on. We may have made a mistake in visiting the botanical gardens on the Isola di Brissago. Fifteen minutes wasn't long enough, we couldn't see anything without a ticket so kicked our heels on the jetty! Brissago, though, was pleasant and we had a nice hour walking around the small town, visiting its church and enjoying the views. 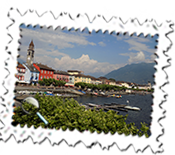 In fact, the whole day on the lake was nice and additionally we visited Locarno, having lunch there, before returning to Ascona. After three lovely days in Ascona, we returned on the Saturday from Zurich, around a three-hour train ride away. After the bus to Locarno, we had booked on to a specific train which turned out to be through wonderful scenery. After a change in Bellinzona, the onward train went past Lake Lucerne and Zug before reaching Zuruch around an hour and three quarters later. 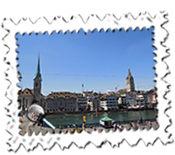 As our flight was not until 4:30 p.m., we stopped in Zurich's Limmatquai area for an hour ad a half. This, too, was beautiful, the weather again making it. Everything went smoothly at the airport and the flight was on time. Never mind that again I could not move in my seat but, as the flight was on time, we could have a reasonable journey back to Swindon. We may not have especially enjoyed it but it was better than the way up, certainly.